This California Umbrella heavy duty 9 foot market umbrella offers all the features a residential owner demands with an improved, commercial grade aluminum frame. The single piece pole and complete rib framework has a standard 2mm wall thickness for superior stability and perfect for demanding commercial conditions and works just as fine for residential use. The strong aluminum frame is matched by a simple and efficient pulley lift system that completes a resilient, easy to use, umbrella frame. The 9 foot umbrella canopy comes in a wide variety of colors and optional designs offering the highest level of customization plus express color choices ship faster so you can enjoy the shade as soon as possible. A great feature of California Umbrella is their commitment to using the finest outdoor fabrics available. This may add a little extra to the price but guarantees an outdoor patio umbrella that is sure to keep it good looks and last considerably more than a single season. 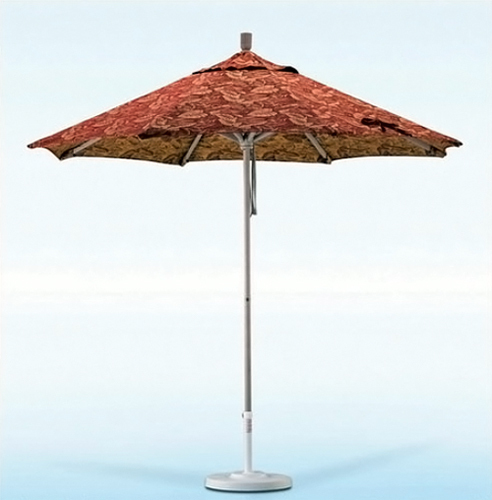 This heavy-duty aluminum market umbrella can be outfitted with a premium olefin fabric or is available is three separate grades of Sunbrella outdoor furniture fabric. The premium quality as well as the grades of Sunbrella all come down to a more sophisticated dye process and in industry standards enjoy the highest rate of U.V. blocking capability. The higher the grade the longer the U.V. blocking time span.